The Insight Prison Project’s Violence Prevention (VP) program helps prisoners to understand the origins of their anger and develop skills to track and control strong impulses before acting on them and perpetuating acts of violence. When it comes to violence, cognitive behavioral programming alone is not sufficient enough to create lasting behavior change. This program offers an in-depth study into transforming violent behavior by helping participants to understand the origins of their anger and that violence is learned behavior. Various forms of violence (i.e. verbal, emotional, physical, etc.) are clearly identified and influences of male conditioning that support violent behavior are examined. The goal of the program is to help prisoners develop practical skills to recognize what "triggers" them into violent and destructive behavior and make alternate choices. 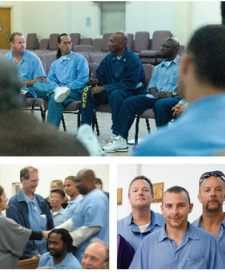 Through the VP program, men become “emotionally literate” and learn deep listening skills while recognizing and communicating emotions and needs. The program effectively takes the mystery out of violence prevention by providing tools to process and heal conditioned tendencies that can fuel anger into violent acts. Men discover the cultural conditioning of the “Male Role Belief System” that justifies their use of violence. They gain an understanding of how they may have confused their authentic sense of self with a self-image of an authoritative male stereotype, and that violence against others is learned behavior that can be unlearned. The program provides a clear map for recovery from violent behavior. For many men it can be a powerful experience of finding peer support, learning how to listen and share previously overwhelming emotions. Often their experience of shame and frustration is transformed into feelings of relief, enthusiasm and a desire to become true "peacemakers" in their families and communities.